All-day comfort, and a lightweight, one-piece construction make AeroSport the ultimate active-use armband for athletes of every stripe. We start with a lycra core for flexibility, light weight and amazing comfort. The band is cut wide so it stays put comfortably without overtightening. 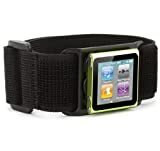 Fit AeroSport to your arm, then slide your iPod nano securley into place. You retain complete access to screen, ports and controls. Griffin Tech. Dock400 firewire list at $17.99 now its $9.99 compare this with Apple's price of $25 bucks and these work just as good. 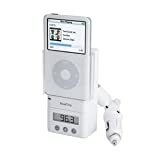 Great for the traveller, use your iPod on your car stereo. Normal price $89.99. No Rebate Needed Here! Did you know that there is a major difference between the white iFM and the black iFM dock ? The white can record FM while the black one can't. Curiously, they both sell for the same price most places; more annoying many stores wrongly advertise the black one as capable of recording. The iPod Mini is the surprise hit of the season, considering it was discontinued but is commanding a premium price on eBay. But what's an iPod without an iTrip? Griffin iTrip for $22 new or $13 used! Regularly $50!!! This really grinds my gears because I bought mine locally a few weeks ago for $40, and it was the old style one. Lo and behold I could have gotten it for as little as $13! GRR!!! Get a NEW Griffin iTrip for $22! Unbelievable deal! Especially since they retail for $40-$50. 1 Penny away from free shipping. This is a nice little charger that works with iPods with a dock connection. It will charge in standby mode and while playing music. 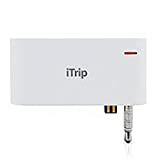 Also comes with a 4 foot dock connector IEEE 1394 cable.